Begin watering your lawn immediately! The wetter you can keep the seed, the sooner it will germinate and protect against storm/runoff damage. At first, you simply need to water enough to thoroughly wet the mulch and keep it moist. The best time to water is between 4 and 8 am; evening is better than midday. Once a day is usually sufficient, more often is even better. Depending on weather conditions, seed should begin to sprout within 3 days to 1 week. Once the seed does sprout, it is imperative to continue watering, as the tender sprouts can dry up in less than a day. As the sprouts continue to grow, begin to water deeper into the soil to encourage root growth. Once the sprouts are 2-3 weeks old, and several inches tall, you may begin to cut back from daily watering. From this point, water until the ground is saturated, every 2-3 days. After 60 days from germination, weekly watering should suffice, except in extreme summer conditions. Once the lawn has been cut several times, water 3 times monthly, and soak the ground completely. After your lawn has been established for several months, water as needed when signs of drought are seen. It's a good idea to watch your lawn very closely when cutting back on the frequency of irrigation. If you see signs of stress, resume the previous week's schedule and wait a eek or two before trying to cut back again. Do not apply any weed control products for the first 30-60 days (consult the label of the product). After that period, one application should take care of any undesired weeds. 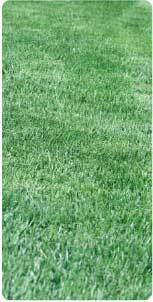 We recommend fertilizing your new lawn at 30 days. Apply at a rate 1/2 of the recommended rate for an established lawn (consult the label of the product), and apply the remaining 1/2 at 60 days. Do not apply at the full rate or it will damage your new lawn.